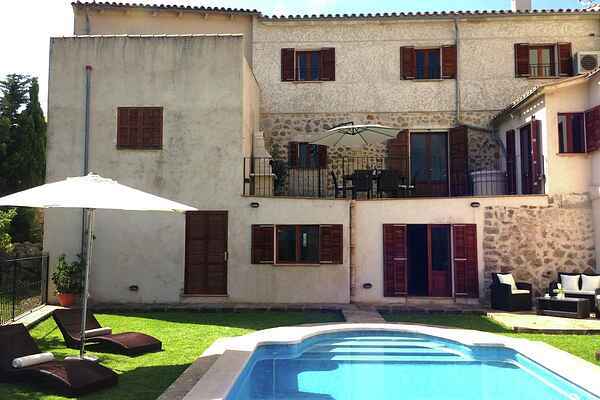 This group accommodation is situated in the small town of Búger, located in the north of Mallorca. This picturesque village offers you all the peace and quiet you will need. Although there are neighbours on each side of the house, there is enough privacy provided. You will have your own garden and a spacious private pool. This lovely country home is furnished with great care and taste. The interior is prefect adapted to the culture and authenticity of Mallorca. The kitchen is equipped with all modern facilities and all bedrooms are air conditioned. Furthermore, the cosy living room offers various facilities for relaxation. Enjoy a drink on your terrace, which gives you a breathtaking view of the vast interior of Mallorca. It offers you a view of the mountain landscape filled with beautiful green trees. Besides the possibility to discover this diverse nature, you can also choose to take a dip in your pool. Or pay a visit to the beaches of northern Majorca. These are just fifteen minutes away from the mansion.